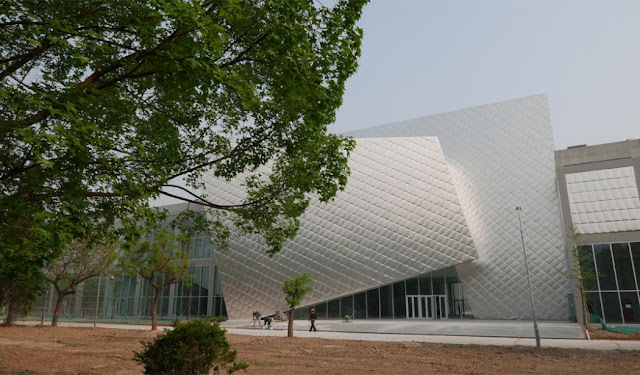 The much-anticipated Beijing Minsheng Contemporary Art Museum, touted as the largest private museum in China, was finally unveiled at a special opening ceremony on June 25 after three years in the making. Funded entirely by China Minsheng Bank to the tune of some 200 million RMB, the new museum is housed in a decommissioned electronics factory from the 1980s, and occupies a strategic location just to the north of 798 Art Center and the Pace Museum. It is also the third such institution bearing the Minsheng name, after the Shanghai Minsheng Art Museum and the Shanghai 21st Century Minsheng Art Museum. The massive new facility is designed by the award-winning firm Studio Pei Zhu, also responsible for the Dali Art Museum in Yunnan (2014), the OCT Design Museum in Shenzhen (2012), the Pace Museum in Beijing (2009), and the Art Museum of Yue Minjun in Sichuan (2007). It is made up of several geometrical boxes that come together in an organic, irregular fashion, yielding a total floor area of some 35,000 square meters. Immaculate white surfaces are strategically broken up by raw, industrial remnants that evoke the industrial past of the site, while the external façade features a trio of interlocking, gleaming reflective volumes that recall Frank Gehry’s Walt Disney Concert Hall in Los Angeles. Prominently displayed in the atrium is Yan Lei’s “Luminous Object of Civil Power,” a huge, disc-shaped artwork measuring five meters across made of LEDs in various colors. Yan’s piece is part of the inaugural exhibition “The Civil Power,” an ambitious group show featuring some 186 works by 159 artists that explore how the notion of civil society in China has taken shape over the course of the three decades since the country’s first economic and social reforms under Deng Xiaoping. Comprising three sections, the exhibition includes works by invited artists, literature and other documentation, and artworks submitted through an open call for entries.